Born in Hong Kong, Vanessa trained at the Royal Ballet School Associates and Rambert School of Ballet and Contemporary Dance gaining a BA (Hons) in Ballet and Contemporary Dance. 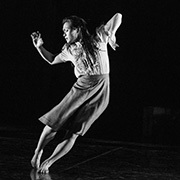 Whilst at Rambert School Vanessa performed works by Mark Baldwin, Kerry Nicholls and Martha Graham. More recently she has performed with Artists North and Thick Skin, with whom she performed at the Lawrence Olivier Awards. Vanessa joined Phoenix Dance Theatre in August 2011 as an apprentice dancer through the London Contemporary Dance School Apprenticeship Scheme, gaining a distinction for her Postgraduate Diploma, before becoming a dancer with the company in 2012. In July 2018 Vanessa was also chosen as Dancing Times’ Dancer of the Month.